Our Queens Pest Control Exterminator will identify the source of the pest infestation & create a customized treatment plan to eliminate the pests. 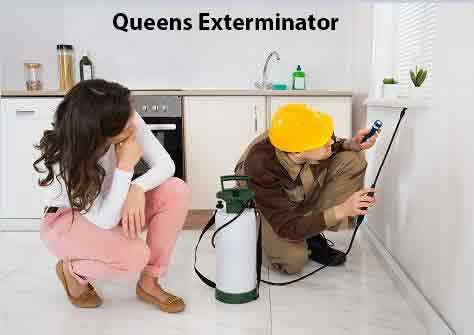 Let us be your Queens Exterminator, Give Us A Call Today. 1-844-305-8999. A common pest in Queens, NY are the Sewer flies. Sewer Flies are also known as moth flies, filter flies, and drain Flies. Drain flies breed in areas that are moist and have a lot of organic debris. Drain flies are a big nuisance and can transmit harmful bacteria and diseases. The most common flies in New York City are the Blow Fly, Fruit Fly, Drain Fly, Flesh Fly, House Fly, Cluster Fly, Horse Fly and the Crane Fly. See our Fly Chart on our Fly Pest Library Page. If you notice you have a Fly Infestation or would like an Inspection, Give Us a Call today. We treat for all types of flies, we will eliminate your fly infestation fast and efficiently. Skunks have been the most commonly confirmed rabies species, other than raccoons in Queens, NY. The most common Skunk found in New York City is the striped skunk. Skunks can certainly be a nuisance to say the least. They are harmless; however, they can cause serious damage to a property while foraging for food. Skunks have strong forefeet and long nails, which make them excellent diggers. They dig large holes in lawns causing extensive damage. If you notice you have Skunks on your property and would like them removed, Give Us A Call Today. We humanely Trap Skunks utilizing Havahart Traps and Relocate them. Even though the City of New York has been cooperating with the federal government to vaccinate raccoons on Staten Island NY, Brooklyn NY, and Queens NY against rabies they are still the main carrier of Rabies. Raccoons in New York City have also been known to have Distemper. Raccoons with distemper act disoriented and lethargic. They can become aggressive especially during daylight hours. If you have Raccoons on your property and would like them removed, Give Us A Call Today. We specialize in Raccoon Trapping and Removal. We humanely Trap Raccoons utilizing Havahart Traps.